Our free GeoDirectory plugin ships with only one Post Type called Places. But sometimes you would like to have separate name for each listing type ( Ex: Bars, Hotels, Restaurants etc ) instead of one generic name Place. By installing our Custom Post Types add-on, you are removing that barrier. You can create Unlimited number of Post Types. The advantages of this plugin are that instead of trying to manage a large diverse directory with many categories all under the one post type, you can split these into more manageable CPTs, you will then be able to add different custom fields to each CPT and be able to manage pricing for each easier. This plugin also integrates well with our Advance Search Filters addon and will let you search per post type and also have different advanced filters per post type, for example a CPT “Hotels” could have filters such as “Free WiFi” and another CPT “Points of Interest” could have a filter “Great for Kids”. Download Geodir Custom Posts zip file. After activation you will be redirected to GeoDirectory > Custom Post Types page. This is the page where you can Add, Edit or Delete your post types. No additional configuration needed. To add a new post type, click the “Add Post Type” link from the Custom Post Types page. 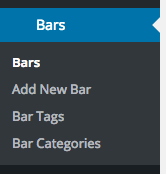 The following example assumes you are planning to create a custom post type called Bars. If you are planning to create different post type, change the values accordingly. Lower-case characters and underscores only. Once added the post type system name cannot be changed. This will be displayed in your url. Lower-case characters, underscores and hyphen(-) only. Position at which this post type will appear in post type list everywhere on the website. Note: If the entered value is already an order of other post type then this will not make any effect. If you set an image here, this will be used as listing thumbnail image when no image available. General name for the post type. Name for one object of this post type. Defaults to value of name. The default is Add New for both hierarchical and non-hierarchical types. The add new item text. If you leave this blank Add New Item text will be used. If you leave this blank Edit Item text will be used. if you leave this blank New Item text will be used. If you leave this blank View Item text will be used. If you leave this blank Search Items text will be used. If you leave this blank Not Found text will be used. The not found in trash text. If you leave this blank Not Found In Trash text will be used. Text label for “Profile” tab on post detail page. This is Optional. So leave Empty unless necessary. Text label for “More Info” tab on post detail page. Text label for Photo” tab on post detail page. Text label for “Map” tab on post detail page. Text label for “Reviews” tab on post detail page. Text label for “Related Listing” tab on post detail page. If checked it will disable post listings (of the current post type ) in Appearance > Menus. If checked it will disable post categories (of the current post type ) in Appearance > Menus. If checked it will disable post tags (of the current post type ) in Appearance > Menus. If checked, Author feature will be enabled for current post type. If checked, Thumbnail feature will be enabled for current post type. Current theme must also support post-thumbnails. If checked, Excerpt (Short description ) feature will be enabled for current post type. If checked, Custom fields feature will be enabled for current post type. If checked, Comments feature will be enabled for current post type. Also will see comment count balloon on edit screen when checked. If checked, Post formats feature will be enabled for current post type. A short descriptive summary of what the post type is. The url to the icon to be used for this menu. When set to True, current post type data can be exported. Meta keywords will appear in head tag of this post type listing page. Meta description will appear in head tag of this post type listing page. To edit a post type, click the “Edit” link from the Custom Post Types page. To Delete a post type, click the “Delete” link from the Custom Post Types page. Once you created a new post type, you can see new menu items in the following areas. This page has the following tabs.